Astonishing X-Men has been a consistently great read. Certainly the best X-Men comic book prior to Ed Brubaker taking over the writing duties on Uncanny X-Men. Joss Whedon has impressed me by continually delivering strong stories that are a great mix of humor and action. I fully expect Astonishing X-Men #16 to be another excellent read. Let’s roll to the review. Synopsis: This issue starts with Ord making a jail break from The Peak, S.W.O.R.D.’s headquarters in space. Ord smashes out one of the space station’s windows and grabs hold of a space shuttle flying next to the headquarters. Ord hops inside the shuttle and his getaway is complete. Agent Brand angrily demands that they find out who is working with Ord. Inside the space shuttle, we see Danger, Ord’s new partner in crime, behind the wheel. We then shift to Kitty phasing back up into the mansion. She sees Colossus and Cyclops unconscious. Kitty then questions Blindfold and Hisako about what has happened. We cut to Beast finally finding Wolverine and proceeding to take a big chomp on Wolverine’s leg. (Tastes like chicken.) Wolverine’s claws instinctively shoot out of his hands causing Wolverine to scream like a little girl. We shift back to the Hellfire Club standing in front of the “manger.” This is what they have been after. Emma turns into her diamond form and attempts to smash open the manger’s protective covering. Emma fails to make a dent in the covering and then the protective covering responds by blasting Emma with several energy beams. The mysterious Hellfire member in a hood says that they will use Kitty to go through the protective covering. Speaking of Kitty, we see her running through the grounds outside the mansion and stumble across girlie Wolverine. We then cut to Agent Brand talking to another agent how they thought that Ord was trying to kill himself when he smashed through the window on the space station. And how that would have made sense since he brought back to life the one mutant destined to destroy his entire planet: Colossus!! End of issue. The Good: Damn that Joss Whedon for being so good! Each issue just keeps getting better and better! Astonishing X-Men #16 was another fantastic read. Whedon has this story moving at a perfect pace. This story is very well constructed and has a great flow. And as always, Whedon serves up plenty of very well crafted dialogue. Whedon continues to display his excellent feel for the various characters. Whedon knows the X-Men and get gets that classic feel that the X-Men had under Claremont and Byrne. The opening scene laid the foundation for the plotline involving the new villainous team of Ord and Danger. You have to feel for the X-Men. Once they deal with the Hellfire Club, they are going to have to deal with these two fiends. The scenes with Wolverine hiding in a tree from Beast were absolutely hilarious! Whedon shows off his comedic talent here. This was some classic dialogue. I loved this scene. I can’t get enough of little English school girl Logan! And Wolverine’s reaction when his claws instinctively popped out was great! After seeing all the cool and tough ways that Logan has popped his claws out over the years, it was funny seeing this decidedly un-cool on non-intimidating reaction to popping his claws. It is just a blast to see the uber-tough guy act like such a sissy. The scene with the “manger” was interesting. Whedon continues to drop little mysteries on the reader with each issue. With this issue, it is the manger. Just what exactly is the manger and why has Professor X protected it with a cover that is impervious to the powers of all his students. 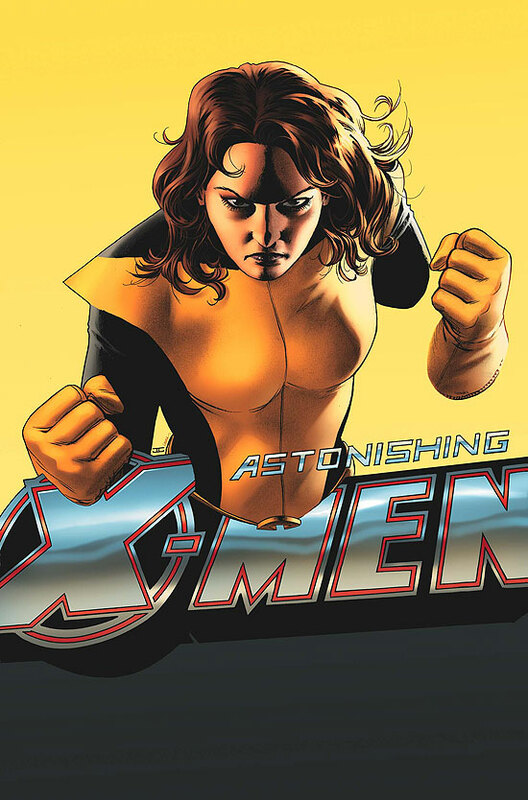 Whedon has been a master at building suspense on Astonishing X-Men and I am definitely excited to find out more about the manger. The scene where Emma hears Kitty and then gets a serious beat down from Kitty was excellent! I don’t even like Kitty, but it was wicked cool the way Kitty attacked Emma through the mirror. Very nice. Then seeing Kitty interrogate Emma by phasing her head into a rock showed a tougher side to Kitty than we usually see. We know that there is no way Kitty would go Wolverine and actually kill Emma, but it certainly showed that Kitty has a backbone and isn’t afraid to get her hands dirty. The best part was after acting all tough; Kitty leaves Emma in the cave “to think about what she has done.” How school teacher-ish! Just perfect. Then Whedon drops a huge bomb on the reader. Whedon continually outdoes himself. Just when I think he can’t do anything else to surprise and amaze me, he does. This time, it is the revelation that the hooded Hellfire member is none other than the original White Queen! That was awesome! I cannot wait to see how Whedon explains this one to us. And after that scene I thought that Whedon was done with the surprises. Silly me. In the final scene, Whedon reveals that Colossus, who Ord brought back to life, is the mutant destined to destroy Ord’s planet! What a grand twist. I am very interested to see how Whedon handles this storyline. As always, John Cassaday does a phenomenal job with the art. His art perfectly compliments Whedon’s strong story. Cassaday’s art makes for a wonderful book to look at and makes Whedon’s story even more enjoyable. The Bad: I have no complaints at all with this issue. Overall: Astonishing X-Men #16 was another incredible read. Whedon and Cassaday just keep hitting them out of the park with this title. It is great to be able to buy an comic book and know that it is going to be a solid read. I definitely recommend this title to anyone. It is certainly worth your hard earned money. ykpffWow,you couldt be more right.I just finished up this issue,and it was well worth the wait. I think astonoshing is probaly one of the top three reads out there right now. I really dont like shadowcat alot, but I dig this new attitude.The dialog with wolverine in the tree was the funniest stuff ive read in a while.Well Rokk,pleae keep up the awesome reviews. I really look forward to each one.